American Vampire Vol. 5 (still no volume title!) contains 13 issues. 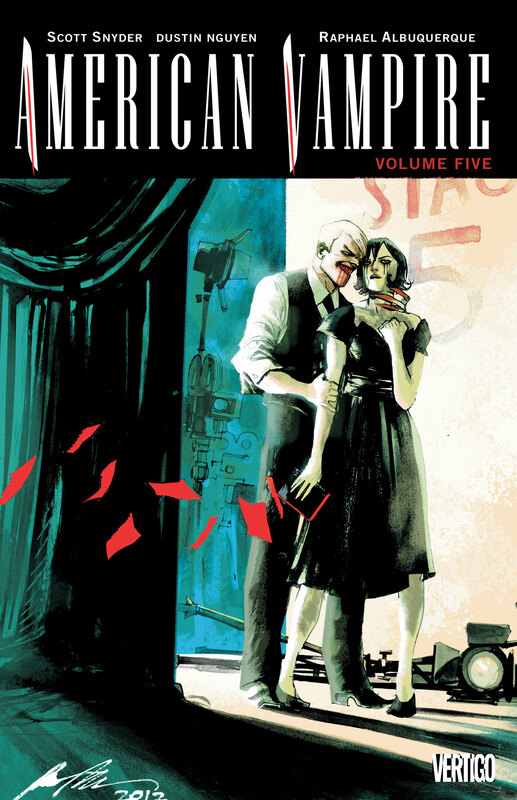 The opening story collects the five-issue miniseries American Vampire: Lord of Vampires. It’s an interesting use of the original Dracula legend (the “Lord” of the title). His reemergence after many years of safe storage spells big trouble for the Vassals of the Morning Star, who begin to look far more vulnerable than they have in the past. It also brings Agent Felecia Book back into the Vassals, and shows Agent Hobbes going out in a blaze of glory. Dracula is taken out of action for the time being, but it’s not a permanent solution, so I won’t be surprised if he returns later. This mini continues the earlier Survival of the Fittest, illustrated by Sean Murphy. Dustin Nguyen’s art here is very reminiscent of Murphy’s. It looked so familiar that I had to double-check to see if Nguyen had been a guest artist earlier in the series. Back in the main series “The Blacklist” story arc brings Pearl and Skinner Sweet back together in Hollywood, where their story began at the beginning of the series. The main story takes place in 1954 at the same time as Lord of Vampires: Agent Hobbes is absent due to business in Europe. And the Vassals eventually come under siege here as well, making that an important theme for the entire volume. This last arc before the series hiatus certainly ties together many threads, going all the way back to the beginning. There had to be a reason why Skinner became a VMS agent, and we find out what they’ve got on him (or in him, strictly speaking: it’s a device they can activate remotely to kill him). So it’s not surprising that he has been working on an escape plan. But the details are a surprise, not least because the Hollywood vampires turn out to be led by Pearl’s old friend Hattie Hargrove. Their attack on VMS headquarters results in the death of Pearl’s husband Henry, and Skinner’s escape, free from the VMS control device. Pearl leaves town (and the VMS) to an uncertain future. I believe we will see her again. I expected the one-shot that concludes the collection to be an aftermath story. But instead “The Gray Trader” introduces a new undead menace, one who has evidently recently arrived from Europe. And he’s a big problem, one of potentially catastrophic proportions. So I guess we know where the series is headed when it resumes. Sweet Tooth Vol. 6: Wild Game is another series-ending collection. The first three issues remind me of many of the things I’ve liked about the series. Two of them feature recurring format experiments. “The Continuing Adventures of the Big Man and the Boy” is a landscape format story (sideways) with a mix of illustrated narrative and conventional comics. “The Singh Tapes” uses a split-screen technique, with Dr. Singh’s journal running across the bottom of the page, while a flashback of the historical events he refers to is depicted above. “The Ballad of Johnny and Abbot” is largely devoted to the childhood of the two brothers in flashback, illustrated by guest artist Nate Powell. Despite all of the back story in these issues, the main narrative in the present also pushes forward at a good clip. The title arc “Wild Game” is in four parts. It’s the long-expected final confrontation between Jepperd and Abbot: fittingly enough, it takes place in the Alaskan laboratory that may have been the source of the hybrids and the plague. There’s a protracted gun fight that precedes it, and it should be mentioned that there’s a huge body count (that’s without even counting the earlier attack on The Dam). This whole collection is a bit like reading The Walking Dead: any character could die at any time. While life has certainly been rough and violent throughout the series–it is a dystopia, after all–this feels like an escalation. Another thing about the title arc: it seemed to read much faster than the average issues. It was action-packed, and paced like it. The final issue of the series (“Home Sweet Home”) is double-sized, and serves as an epilogue. 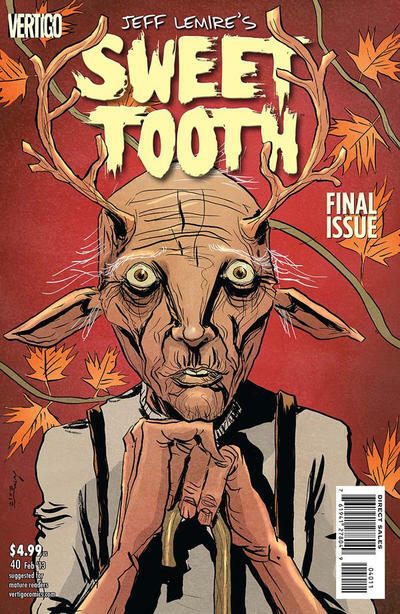 The cover (which is also the cover of the collection) telegraphs the ending: Sweet Tooth lives to old age. 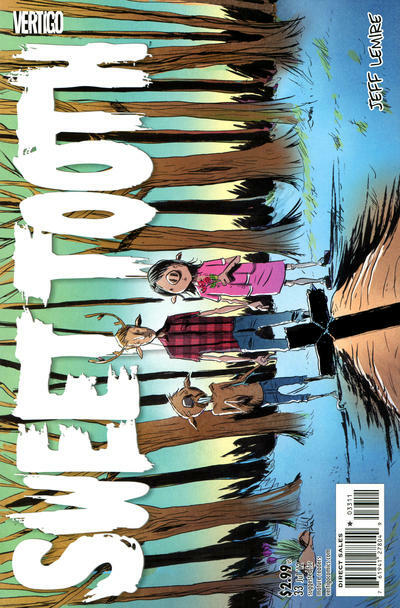 The story tells the history of the hybrid society that Sweet Tooth founded, ultimately spanning generations. It’s mostly a story of peace, although there is a final confrontation with the dwindling human population. After all of the violence and conflict that drove the series, life goes on. As series endings go, this was OK. My main complaint is that it was somewhat predictable, and didn’t deliver any sense of closure. It was looking less and less likely that a cure would be found, especially after the previous issue depicting the voyage to Alaska that revealed that the hybrids had existed for years. And I don’t have much tolerance for the mystical turn the story took. Not that it was very deep: they hybrids arose because humanity was unable to live in harmony with nature. So I accepted the conclusion as inevitable, and just appreciated the skill in the telling of it. Suddenly revealing a scientific cause and a cure would have been a nice twist! I can’t say if the final issue was planned from the beginning. But once the shape of the story was set, I doubt that Lemire ever intended to spend multiple issues depicting the establishment of the hybrid society. I enjoyed the quick look at how it all came out, although it would have been more explosive if the story had simply ended with Jepperd’s death. 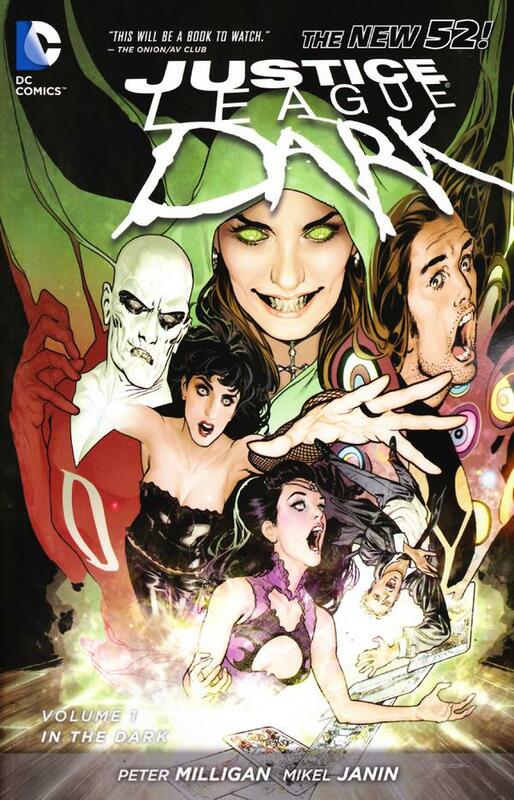 Having just finished reading the Hellblazer finale, it’s an appropriate time to finally catch up with Justice League Dark Vol. 1: In The Dark. I’m pretty familiar with the soon-to-be team, but it’s still a bit confusing to just get dropped in without much information on the status quo. And I’m completely unfamiliar with Enchantress, who’s at the heart of the whole story. John Constantine does pretty much seem like the character I know and love, except much younger than the naturally aged Constantine that Peter Milligan was writing at about the same time. As the story opens there’s havoc being created all over the planet. Madame Xanadu sees a coming time of great evil. The Justice League identifies Enchantress as the source: Superman, Wonder Woman and Cyborg go to confront her, and are turned back by magic. That establishes why the cover says “Justice League,” with Zatanna as the bridge between the traditional JLA and this one. Xanadu’s clairvoyance shows that the only team that can solve the problem is an unlikely one: magicians Zatanna and John Constantine, reality-altering Shade, and Deadman (whose power is to temporarily take over the bodies of the living). Deadman meets June Moone (Enchantress’s estranged alter ego), while Xanadu tries to use Shade to gather the team together. When Zatanna fails to overcome Enchantress on her own, the team (with the assistance of Mindwarp) manages to overcome her magic to make her whole and stop the madness emanating from her. In the aftermath, the group gathers at Xanadu’s place and finds themselves fighting off a creature created by Shade’s M-Vest. She tells them that they must stay together: the future demands it. As a longtime Vertigo reader, I’m probably about the last person this series is aimed at. I wasn’t a big fan of team books when I was a superhero reader, so this struck me as a questionable concept to start with. Yet I will admit that the story worked pretty well for me. Having Peter Milligan at the helm certainly helped, and I liked Mikel Janin’s art as well. The team approach suffered from the usual difficulties. Madame Xanadu’s powers are central to the story, but they’re not very visual: basically they involve her looking dismayed while seeing nightmarish future scenes. Shade’s powers can be depicted visually in traditional superhero style, so he appears a bit too often. Deadman (Milligan gets the attitude exactly right in his dialog) needs to have somebody useful to possess, which can be a stretch. But in the end I liked the collection well enough to read more. This entry was posted in DC Comics, Vertigo comics and tagged Dustin Nguyen, Jeff Lemire, Mikel Janin, Nate Powell, Peter Milligan, Rafael Albuquerque, Scott Snyder. Bookmark the permalink.